What is Zigbee? ZigBee is a personal-area network standard. ZigBee specification considered as an alternative to Wi-Fi and Bluetooth for some applications. Unlike LoRa and Wi-Fi, multiple central controllers can be used for Zigbee. Zigbee is the name of the specification of a set of high-level wireless communication protocols for use with low-power digital broadcasting, based on the IEEE 802.15.4 standard for wireless personal area networks (WPAN). Its objective is the applications that require secure communications with low data transmission rate and maximization of the useful life of batteries. Easy integration with very little electronics. Zigbee is based on the physical level and access control medium (MAC) defined in the 2003 version of the IEEE 802.15.4 standard. The relationship between IEEE 802.15.4-2003 and Zigbee is similar to that between IEEE 802.11 and Wi -Fi Alliance. ZigBee 1.0 specification was approved on 14 of December of 2004 and is available to members of the development group (ZigBee Alliance). A first level of subscription, called adopter, allows the creation of products for marketing by adopting the specification for $3,500 per year. This specification is available to the public for non-commercial purposes. Zigbee uses the ISM band for industrial, scientific and medical uses; in particular, 868 MHz in Europe, 915 in the United States and 2.4 GHz worldwide. However, when it comes to designing devices, companies will almost always opt for the 2.4 GHz band, because it is free all over the world. The development of technology focuses on simplicity and low cost more than other similar wireless networks of the WPAN family, such as Bluetooth. The most complete Zigbee node theoretically requires about 10% of the hardware of a typical Bluetooth or Wi-Fi node; this figure drops to 2% for the simplest nodes. However, the size of the code itself is much larger and is about 50% the size of Bluetooth. 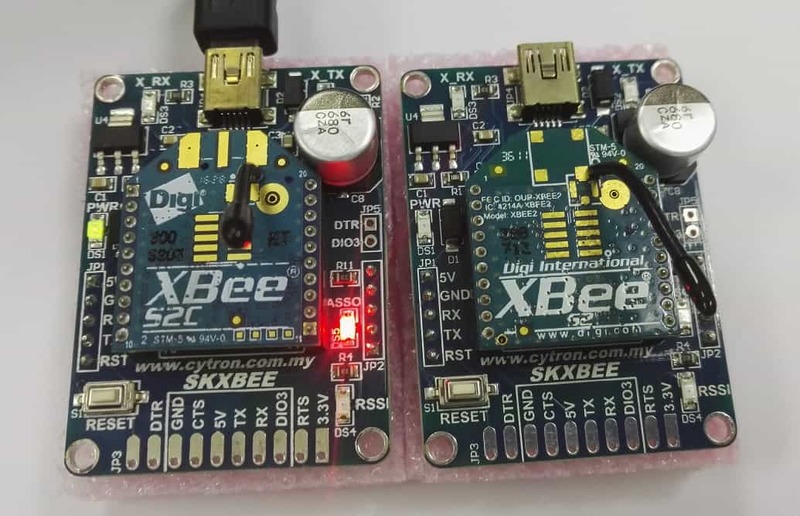 In 2006 the market price of a transceiver compatible with Zigbee is close to the dollar and the price of a set of radio, processor and memory is around three dollars. In comparison, Bluetooth had in its beginnings (in 1998, before its launch) an expected cost of 4-6 dollars in large volumes; at the beginning of 2007, the price of common consumer devices was about three dollars. The first version of the stack is now called Zigbee 2004. The second version, current as of June 2006, is called Zigbee 2006, and replaces the MSG/KVP structure with a library of clusters, leaving the previous version obsolete. Finally Zigbee Alliance has presented the 2007 version of the stack. Some new application profiles are also included, such as automatic reading , automation of commercial buildings and automation of homes based on the principle of use of the cluster library. Sometimes Zigbee 2007 is called Pro, but Pro is actually a stack profile that defines certain characteristics about it. The Zigbee 2007 network level is not compatible with Zigbee 2004-2006, although an RFD node can join a 2007 network and vice versa. Routers of the old versions can not be combined with a 2007 coordinator. Zigbee Coordinator, ZC : The most complete type of device. There must be only one per network. Its functions are to take charge of controlling the network and the paths that devices must follow to connect with each other. Zigbee Router, ZR : It interconnects separate devices in the topology of the network, in addition to offering an application level for the execution of user code. Zigbee End Device, ZED : It has the necessary functionality to communicate with its parent node (the coordinator or a router), but it can not transmit information destined to other devices. In this way, this type of node can be asleep most of the time, increasing the average life of its batteries. A ZED has minimal memory requirements and is therefore significantly cheaper. As an example of application, in a room of the house we would have several Final Devices (like a switch and a lamp) and an interconnection network made with Zigbee Routers and governed by the Coordinator. This Article Has Been Shared 7077 Times! What is LoRa? What Are the Differences Between LoRa and WiFi? WiFi is limited in range, consume huge battery. LoRa is specially designed for the IoT devices. Cyberspace : What is Cyberspace ? Cyberspace is made up of two words – Cyber ? ?and Space. This is used to indicate a space over internet where online communication can be done. Real-Time Transport Protocol or RTP is a packet -based protocol protocol for continuous transmission of audiovisual data over IP -based networks. Verified Profiles and Names in Social Networks are Kind of Internet Achievement to Many Users. Here are Some Information That Might Be Helpful. Cite this article as: Abhishek Ghosh, "What is Zigbee? What Are the Differences Between LoRa and Zigbee," in The Customize Windows, March 21, 2019, April 18, 2019, https://thecustomizewindows.com/2019/03/what-is-zigbee-what-are-the-differences-between-lora-and-zigbee/.